ISLAMABAD (92 News) – Pakistan Tehreek-e-Insaf chairman Imran Khan has on Thursday said that the dishonesty of Prime Minister Nawaz Sharif and some of his ministers that is being revealed is shocking even for those of us who have known their greed for money. 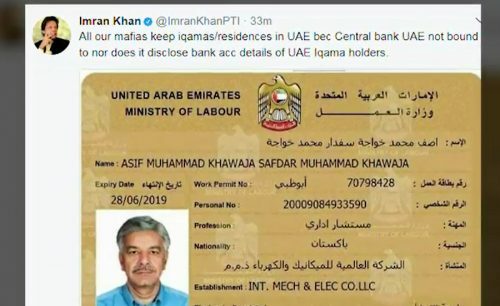 In a series of tweets on Thursday, he said that all our mafias keep Iqamas/residences in UAE because Central bank UAE not bound to nor does it disclose bank account details of UAE Iqama holders. 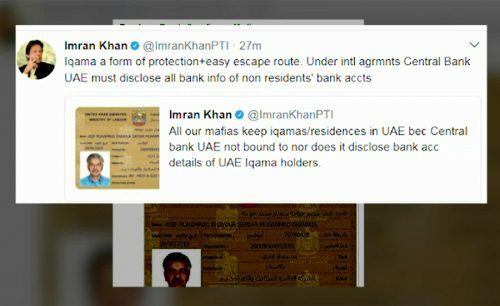 The PTI chairman said that the Iqama is a form of protection and easy escape route, adding that under international agreements Central Bank UAE must disclose all bank information of non residents’ bank accounts.